Blues Pills headed to the UK as part of their European Tour. 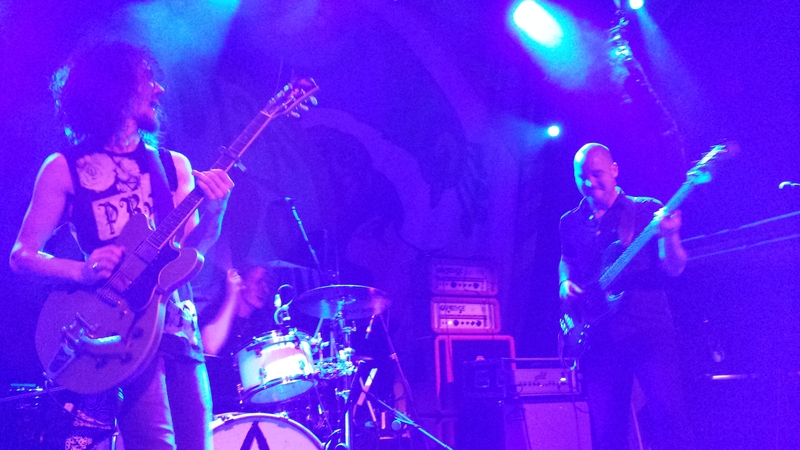 With support from The Pearl Harts and RavenEye completing the line-up, RARC hit the motorways to see what was the hottest tour of the year, well, a few times. Female band The Pearl Harts are one quite simply one of the best duo’s around at the moment, the fact they are opening for Blues Pills is testament to this. Blending the simplicity of guitars and drums with samples, the band produce a sound that fills any size venue with a deep and heavy tone, which when combined with the powerful vocals of Kirsty and the elevated harmonies of Sara, this was a set that caught the attention of every one there. Their songs were intriguingly about subjects that ranged from acid trips to invincibility, as songs such as ‘Wolf Eyes’ were delivered with a heavy dose of rock. 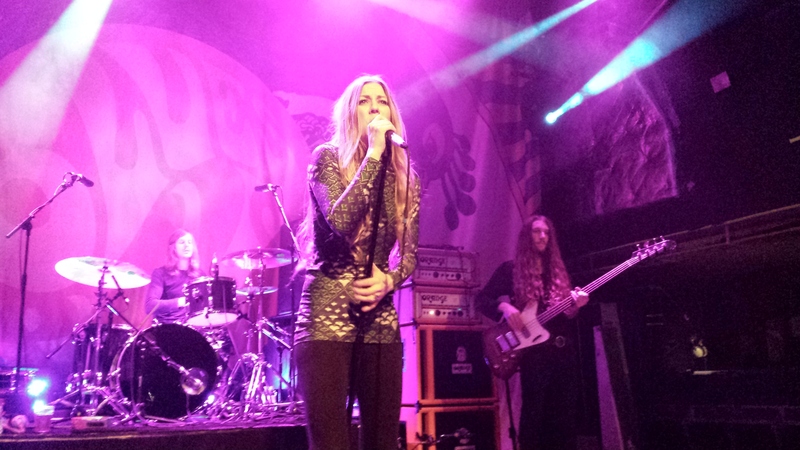 With an element of grunge and even a touch of blues to their sound, ‘Under My Skin’ had a hypnotic quality about it, as the immense vocals sublimely worked their way through the song over the impressive guitars. However it was their single ‘Skeleton Made Of Diamonds’ that really worked its magic on the crowd, with its groove-led guitars that defined how talented the band were. The Pearl Harts may have been an undiscovered gem for many of those there, but it is not going to remain so for very long. 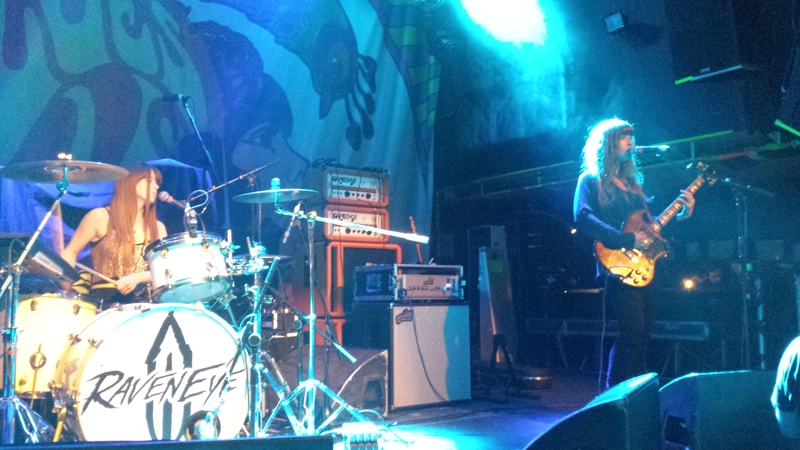 To say trio RavenEye are an energetic band probably doesn’t do them justice. With Kev Hickman twirling the sticks throughout whilst showing his prowess on the drums, bassist Aaron Spiers giving it some serious groove-led moves and singer/guitarist Oli Brown being a livewire by getting in with the crowd, standing on the kick drum and generally being full of animated charisma, the band rocked out to the songs as much as the crowd did. ‘Get It Started’ and new song ‘Come With Me’ left no doubt in anyone’s minds there that with the superb vocals, monster guitar hooks and infectious rhythm, this was a band to see live. Taking it down just the smallest of notches, ‘Run Away’ was one of those catchy songs that had you swaying away to it. As the crowd clapped and sang along to ‘Hey Hey Yeah’ with its pounding beat, the massive smiles from the band were matched by those there who were completely into their songs from the outset. Unrivalled for their rock sound, they were also equally engaging with the softer ‘Home Sweet Home’ which was a rich texture of harmonies that blended with the delicate guitar and drums, still powerful to hear. Single ‘Breaking Out’ took it up a notch higher by being the ultimate song to rock out to, filling each venue with riff after riff of epic proportions and ‘You Got It’ saw the band tearing up the stage in a final rock star flourish. RavenEye have defined themselves as no longer breaking out, as their performances on this tour so far have been that of a band who have well and truly made it. There are some singers who have a great voice, there are some singers who have an amazing voice, and Elin Larsson of Blues Pills is most definitely in the latter. The powerful vocals had the ability to captivate the audience from the very first note, which complimented the retro yet modern blues infused sound from the band to excellent effect. Backed up by the thumping rhythms of bassist Zack Anderson and drummer André Kvarnström who were the powerhouse behind the songs and guitarist Dorian Sorriaux, with his tantalizing guitars, added to the layers of a maelstrom of sound this band can produce live. ‘High Class Woman’ with its pulverising drums shook the venues each time as Elin danced barefoot, hair flying along with the tambourine as she swirled and twirled around the stage to the powerful beat of the song. Delighted to be back in the UK for the 3rd time this year, it showed throughout the set, and with the rare ability to endear themselves to a diverse crowd at each venue, ‘Ain’t No Change’ and the haunting ‘No Hope Left For Me’ with its smoky blues vibe, as well soaring guitar solos during many of their songs, proved Blues Pills are at the very top of their game live. With a psychedelic-infused touch to many of their songs, this was a powerful set as the tempo changed throughout, and the Tony Joe Wright cover of ‘Elements And Things’ picked up the pace with its intense groove. Without the band, the opening vocals on ‘Devil Man’ were just stunning before the music exploded into the song, making this one of the most popular tracks on the tour and rounding off with ‘Little Sun and ‘Black Smoke’, the set had been electrifying from start to finish. On their first night in London, Elin said to the crowd “When I was a little kid, I could never have imagined this”. The man who replied “you deserve it” spoke on behalf of everyone, as Blues Pills more than deserve their success, being this excellent live.